intriguing animals; they are the 4th smartest animal group on the planet, they are clean, and they are affectionate. Yes, you read that right, they are clean. When pigs roll in mud they are using the mud to help regulate their body temperature because they don’t have sweat glands. Go figure, right? 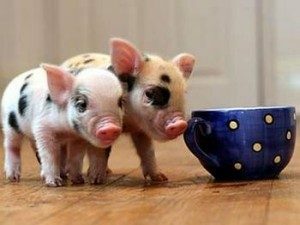 These adorable miniature pot-bellied pigs will require being fed twice a day on a diet that consists of special pig food, fresh fruits and vegetables. Water must always be available. Pot-bellied pigs enjoy companionship and cohabitate well with other animals, like cats and dogs. The other great thing about mini pot-bellied pigs is that they can be housebroken. You can train them to use a litter box or to ask to go outside! So you won’t have a pigsty somewhere in your house! Like dogs they require to be bathed regularly and will have veterinary bills. When taken care of properly they can live up to 15 years. You can search online for reputable breeders. Do your due diligence on the breeder to ensure you are getting what you are paying for. There are also organizations that have mini pot-bellied pigs available for adoption. 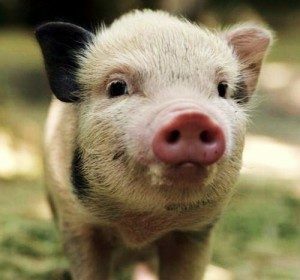 No matter where you decide to get your pig from, this pet will provide you with years of companionship and enjoyment. Have a snorting good time! Oink, oink!